Five Star Bath Solutions of Salt Lake City delivers the highest quality materials and professional bathroom remodeling services, while respecting your time, space, AND budget. We provide five star quality bathroom renovations WITHOUT the five star price. Period. From bath accessories and enhancements to bathroom remodels, we deliver beautiful bathing space transformations to your home all while being Clean, On-Time & On-Budget - Guaranteed. We proudly serve Salt Lake City, Murray, Sandy, Draper, West Valley City, West Jordan and all surrounding areas. For a limited time GET 10% OFF! when you schedule online for your free In-Home Consultation. Professional bath remodeling in Salt Lake City for new showers, tubs and more. We provide affordable Salt Lake City bathroom remodeling solutions and a detailed quote for your consideration in the comfort of your home. Serving: Salt Lake City and all surrounding areas. 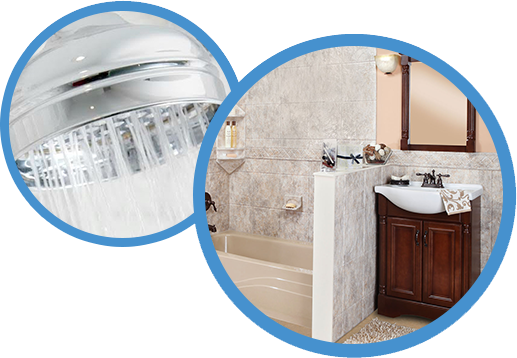 We take care of your bathroom renovation in three steps. First Step - You fill-out the form on our site or call us at (801) 919-3803. Our cordial staff will schedule a free in-home estimate with no obligations. Second Step - Our estimator will come to your home and listen to your bathroom renovation needs and vision. They will then show you available options from our catalog, take measurements and create a plan to suite your budget. Third Step - The estimator will scheduled your bathroom renovation at a convenient time for you. Our professional installers will arrive on time with all the necessary tools and supplies. Before you know it, your new bathroom will be ready with all the desired features and fixtures. For over 15 years, we have offered affordable renovations at Five Star Bath Solution. We have 30 locations across North America. At Five Star Bath Solutions of Salt Lake City, our customers are of the utmost importance. We give the highest consideration to your needs and desires for your bathroom renovations. Our mission is to have satisfied and happy customers. You will never be pressured to hire our services after the free estimation. If you are interested in a free, no obligation, in-home estimate, call (801) 919-3803 today. Take advantage of our free, in-home consultations and estimates today. Call us at (801) 919-3803! Bathroom renovation can prove to be a headache if you don’t get the services done by experts. This can leave you frustrated with a badly renovated bathroom. So don’t let yourself be cheated and make the most of our exceptional, honest and expert services at Five Star Bath Solutions of Salt Lake City. We will take on the entire job and provide you premier bathroom remodeling services within the estimated budget. We don’t leave our work until you, the client, is fully satisfied with it. So give us a call right away at Five Star Bath Solutions of Salt Lake City to have your bathroom beautifully renovated. Call us at (801) 919-3803 to get your free bathroom renovation estimate. When it comes to bathroom renovation, nobody wants a salesman at their doorstep! What you want is a bathroom renovation specialist who focuses on you and your needs for your bathroom. Our estimators are skilled and knowledgeable. They can help you come up with a plan and budget to fit your needs and pocket book. Our estimator will visit your bathroom and you’ll be shown different options from our electronic catalog. We offer over 9,000 top quality products and accessories. You’ll then be given a customized quote to have the bathroom of your dreams. All the estimations are done at a convenient time for the customer. 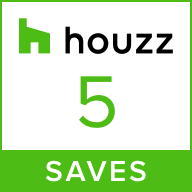 You’ll never be pressured to commit to the renovation after the free in-home estimate. Your home’s safety is of utmost importance to us. We make sure that all our craftsmen who visit your home are screened, insured, licensed and have an extensive background check. Our experts are credible and professional. You don't need to worry about their presence in your home, for either estimation or installation. We, at Five Star Bath Solutions of Salt Lake City, follow a strict policy of hiring individuals after a thorough screening. We care for your safety, security and protection. Our craftsmen are given the best training and they follow absolute factory specifications. We spend a lot of time and money training our professionals. We understand what kind of effect a bad installation can have, even with the best quality products available. We leave no loopholes in our services. We want to make your dreams of a newly remodeled bathroom a reality. We offer a free estimate for your bathroom renovation at your convenience. So call (801) 919-3803 now to get started with Five Star Bath Solutions of Salt Lake City. Remember you’re just a phone call away from the bathroom of your dreams! Take advantage of our free, free, in-home consultations and estimates today. Call us at (801) 919-3803! Five Star Bath Solutions of Salt Lake City is considerate of your needs. We have a variety of products to give you the best possible renovations within your estimated budget. We know your time and money is valuable. We’ll take care of everything, renovating your bathroom in an effective and affordable way. Bathroom renovation can be life-changing. A renovated bathroom can improve your mood every time you see it. So gear up to enhance the quality of your life and contact Five Star Bath Solutions of Salt Lake City. We take pride in the amazing feedback and referrals we receive from our happy customers. We are dedicated to giving you a positive bathroom renovation experience. At Five Star Bath Solutions of Salt Lake City, we want you to have the best bathroom possible within the your estimated budget. Do you wonder whether you could ever get the bathroom fittings you've always wanted? Do you ever feel troubled due to your limited budget for bathroom remodeling? Or do your small bathroom dimensions discourage you when considering a bathroom renovation? These limitations don't have to stop you from updating your bathroom. Five Star Bath Solutions of Salt Lake City makes it possible for all our customers to make their bathroom remodeling goals a reality. We do it well within your budget, with the help of our highly trained team of estimators and installers! Our customers will always be the top priority. We provide Salt Lake City the best quality products and well-trained craftsmen. Call us at (801) 919-3803 right away to get your bathroom renovated. It’s common knowledge that bathrooms are the most frequently used rooms of a house. Equip your bathroom with a walk-in shower, a hydrotherapy bath, or a customized acrylic bath or shower. It's bound to become a place of comfort, peace and tranquility after a long day at work. We make your bathroom the most tranquil area of your home. You will feel confident showing your remodeled bathroom to your guests. Five Star Bath Solutions of Salt Lake City offers a free, in-home estimate for your bathroom remodeling needs. When you call us, we will schedule a convenient time for you to meet with our expert estimator in your home. You’ll be on your way to getting the most astounding bathroom renovation in no time. Call (801) 919-3803 to arrange a free estimation! Fed-up with the same old mediocre look of your bathroom? Well, gear up and look for solutions! Your outdated bathroom may not even need a full-fledged renovation to give it the trendiest look with all the luxuries. We, at Five Star Bath Solutions of Salt Lake City, offer more than 9,000 diversified techniques and products. We cater to your needs, ranging from low budget to high budget or anywhere in-between. So whatever your budget is, don’t hesitate to call and arrange for a free estimate. There is no obligation to commit to our services. Five Star Bath Solutions offers remarkable functionality, precise techniques, and best possible service. We take pride in providing you the best products at reasonable rates and the best bathroom renovation service in Salt Lake City. Call us at (801) 919-3803 right away for your bathroom renovation. Ever suffered from an injury due to a slippery bathtub? 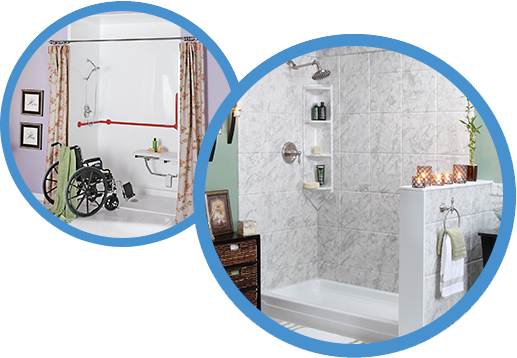 Do you find it difficult to take a bath due to your mobility limitations? At Five Star Bath Solutions of Salt Lake City, are well aware of these problems. We remove these hurdles by providing the best quality walk-in bathtubs tailored to our customer’s needs. Our experts are more than willing to help you choose the right bathtub. Considering your budget, bathroom and personal needs, we help you determine the best choice for you. 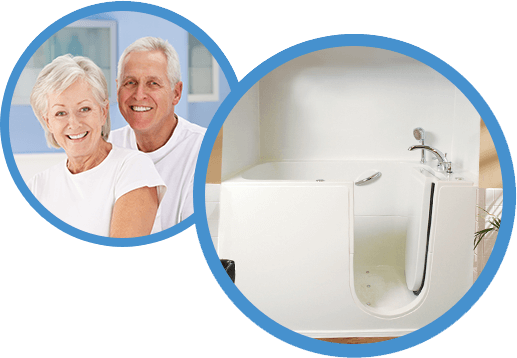 Our customers have taken our advice and enjoy their bathing independence once again in their new tub or shower. We want you to have the same ease of life! 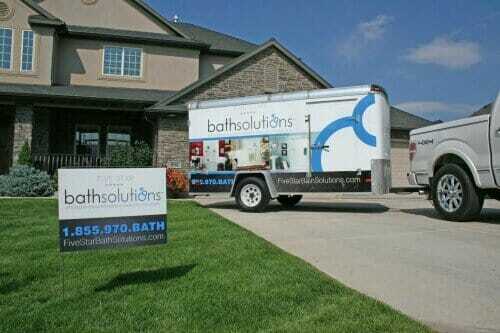 Five Star Bath Solutions of Salt Lake City is always ready to welcome new customers! Contact us now at (801) 919-3803! 13 water jet – three settings, luxurious hydrotherapy system. Faucet handles that are arthritis friendly, along with a convenient hand held shower. Up to ten times faster drainage. Our walk-in bathtubs fit all conventional bathtub footprints. Transporting a new bathtub through your home into the bathroom can prove to be problematic. Our bathtubs have a patented two-piece design which makes them easy to transfer into the bathroom. An extension kit is included to fill in openings from the original bathtub space if there is any left once the tub is in place. These bathtubs come in different shapes and sizes. You can choose one that fits your bathroom best. This will increase the appeal of your bathroom along with improved comfort and ease. A new Five Star Bath Solutions shower enclosure or tub surround could make all the difference you need in your bathroom to make you comfortable. Don’t replace your tub enclosure with tile. Tile takes a lot of work to keep it looking nice because the grout is not completely waterproof and discoloration and cracks form overtime. Because of this, tile must be regrouted to keep it looking nice and prevent water from getting behind the walls and causing damage. There are many alternative options available to resurface your shower or tub surround. Home improvement stores offer prefabricated fiberglass and plastic tub surrounds that are a set size and shape. Five Star Products are customizable to the shape and size of your original tub our showers footprint. which means we don't have to change the walls in your bathroom. The solid bath wall systems are also nonporous and completely waterproof. They come in a wide range of colors and patterns so you aren’t stuck with plain white or almond. Our tub surround surfaces are made from high-quality material. They are UV protected and won’t fade. Because Five Star products are nonporous and quad locked, there is no place for microbes to take hold and start growing. The smooth surface makes cleaning faster and easier. The shower surrounds and tub enclosures are guaranteed to last for the life of the home. Installing one of these tub enclosures increases the value of your home with the beautiful appearance of fine stone and marble. Unlike stone or marble, the upkeep is not nearly as involved as the real thing requires. Our professional technicians can install your new tub enclosure or shower surround in as little as a day. This means you can get back to your normal routine quickly but with a beautiful new bathing area. Let the Five Star team transform your bathroom the right way, our work is completely covered by a full warranty so you don’t have to worry. Call (801) 919-3803 to discover the best choices for you. Nothing makes us more satisfied than getting positive feedback from our happy customers. Our customers are enjoying the luxury of beautifully renovated bathrooms which compliment their lifestyle. We achieve our target through highly trained bathroom remodelers who are local to the area they serve. Our services are customized and tailored to your specific needs. Whether you want a low-budget renovation or an extravagant luxurious setting, we cater to all your needs. We, at Five Star Bath Solutions of Salt Lake City, have vowed to make your bathroom the best room of your house! With our quality products and expert fittings, the appeal and comfort of your bathroom increases. Nothing makes us happier than that. Be it a customized bathtub or shower-fitting, we bring you the best options available. So update your outdated bathroom and bring comfort into your life. Give us a call at (801) 919-3803 right away. Five Star Bath Solutions of Salt Lake City is always available for your bathroom renovation needs. We, at Five Star Bath Solutions of Salt Lake City, provide you incomparable remodeling services. We have worked hard to be the best bathroom renovation providers the industry. Give us a try for yourself! Don’t let your boring bathroom setting discourage you! Add color to your life with a fascinating new bathroom. It’s about time you listen to your inner voice and treat yourself. Five Star Bath Solutions of Salt Lake City is an excellent solution to your monotonous bathroom. Call us at (801) 919-3803 now! When we say Five Star Bath Solutions of Salt Lake City makes your dream come true, we mean it! Five Star Bath Solutions of Salt Lake City is the most authentic service provider for bathroom remodeling and renovation. Our work speaks for itself. Get the best remodeling service available at a price you can afford. Regardless of your budget, bathroom dimensions or any other limitation, the goal of a serene bathroom is achievable! All you have to do is make up your mind, and give us a call at (801) 919-3803! Five Star Bath Solutions of Salt Lake City provides the best bathroom renovation services available. Salt Lake City is one of the most diverse and interesting cities in the United States. It has the buoyant waters of the Great Salt Lake and the stunning snow-covered Wasatch Mountains. It has an estimated population of 1,153,340. It sits at the core of the largest metropolitan area in Utah. Founded in 1847 by Mormon pioneers including George Washington Bradley and Brigham Young. The climate of Salt Lake City is semi-arid with dry, hot summers and snowy cold winters. The weather is dependent on the storms and breezes that come from the Pacific Ocean. Heavy storms cycle in from October through May coming from the Gulf of California. Salt Lake City is home to several historical places. It provides the perfect fusion of history, modernism and futuristic development. The museums here allow visitors to peek into the past. The city and state parks are evidence of a prosperous present. The ongoing plans provide insight into the future. This city is home to several popular and important museums. The Daughters of Utah Pioneers Memorial Museum, the LDS Church History Museum and the Discovery Gate are just a few. These museums offer a wide variety of artifacts, tools, furniture, clothing and art exhibits. The Broadway Theater and Tower Theater are also located at Salt Lake City. The Salt Lake Public Library and the Rose Wagner Theater also provide a platform to watch free shows. The city has enjoyed a reputation as a gateway to the media industry in previous years. Want to enjoy yourself and party hard? Salt Lake City is the perfect place for recreational activities. Sports, clubs, discos and pubs constitute a major part of the night life. Besides the nightlife, the city is the hub of many festivals. The Blue Moon Festival, Labor Day, Hot Air Balloon Festival and Spring Festivals are also worth visiting. Salt Lake City provides the perfect combination of a variety of cultures. Other celebrated festivals include Steamfest, Downtown Yoga Festival, India Fest, and the Ganesh Festival. Several theatrical companies also host shows with professional and amateur performances. Salt Lake City has exceptional and advanced transportation options. There is bus, rail, light rail and cabs available. Ski buses carry vacationers to various ski resorts in the area. The fares for the various options are inexpensive. There is also an ever expanding freeway and high system for personal vehicles. Salt Lake City is the perfect blend of historical architecture, tourist attractions and museums. In fact, Salt Lake City, Utah, is the place to relax and enjoy life. Serving: We serve Salt Lake City, Murray, Sandy, Draper, West Valley City, and West Jordan and all surrounding areas. “Ken brought the samples and photos over and we were able to choose everything in one evening. He was able to schedule our remodel much sooner than I had expected and within a couple weeks our new bathroom was complete. Mike was prompt and included me in even the smallest decisions to make sure it was perfect. They have an outstanding product and service second to none. We could not be more pleased and will definitely call on them for future work. “Five Star Bath Solutions is a fantastic company and gave us exactly what we wanted. They did a walk in shower for us that was very custom and they were able to do everything we envisioned and asked of them. They were very informed and knowledgeable about every aspect of the bathroom remodeling process and the craftsmanship was oustanding. Very glad we chose Five Star Bath Solutions to do our shower as it turned out even better than we could have imagined. “Five Star Bath Solutions is a great company to work with. Their sales person was great to work with and was helpful throughout the entire process. The price was in line with the other companies, but I was most impressed with their quality of workmanship and service. Great company to do business with! Having a hard time cleaning your shower space? Five Star Bath Solutions of Salt Lake City materials make your shower easy to clean and maintain, in addition to protecting your walls from water.